We’re in one of the most beautiful corners of Germany – the area known as Berchtesgadener Land. We’re spending five nights exploring the region, headquartering at one of the best hotels in our list of favorites, the Zechmeisterlehen in the village of Schoenau am Koenigsee. The other day, the beat the heat, we took our group on a tour of one of the old bunker complexes adjacent to where Hitler had his Berghof mountain hideaway. Plans for WWII were laid there. The old bunker was built below the Hotel Zum Tuerken. Temperatures down in the deep bunker more than 50 feet below the surface were in the 50s, so it was a relief from the high 80s above. After the bunker, we had lunch in a shady and cool beergarden with a tremendous view over the Watzmann mountain. 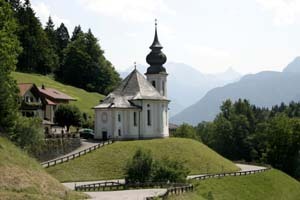 Then, a scenic drive to the hamlet of Maria Gern high above Berchtesgaden.